Eggplant and zucchini, aubergine and courgette...by any names they are delicious. Stuff one with the other and you have a winner. Preheat oven to 400 degrees F. Slice zucchini in half lengthwise. Use a melon baller or spoon to remove some of the core of zucchini. Brush with olive oil, season with salt and pepper and bake on baking sheet for ~10 minutes. Add a drizzle of olive oil to a large frying pan over medium high heat. Sautee onion and garlic for several minutes until onion is translucent. Add eggplant, with another drizzle of oil, and sautee until brown and tender. Transfer to food processor and blend until well incorporated. Add breadcrumbs, cheese, parsley, a sprinkle of salt and pepper and stir unitil combined. 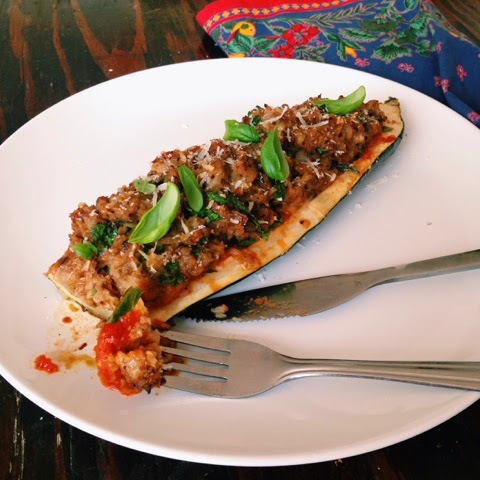 Fill partially baked zucchini with a few tbsp. tomato sauce, then stuff with eggplant mixture. Add a sprinkle of cheese and bake for an addition 15-20 minutes.